The worshippers of the Dark Gods know that there is power in words and numbers, incantations and arcane numerology. Seven is the unholy number of Nurgle, and the preachers of this doctrine are the Tallymen. Part priests, part demagogues, part metaphysical scribes and quartermasters, these festering zealots stride to battle festooned with the trappings of their strange craft – reams of parchment, crawling with tallies of seven in a strange, crabbed hand, counting the horrors inflicted on the Death Guard’s foes. 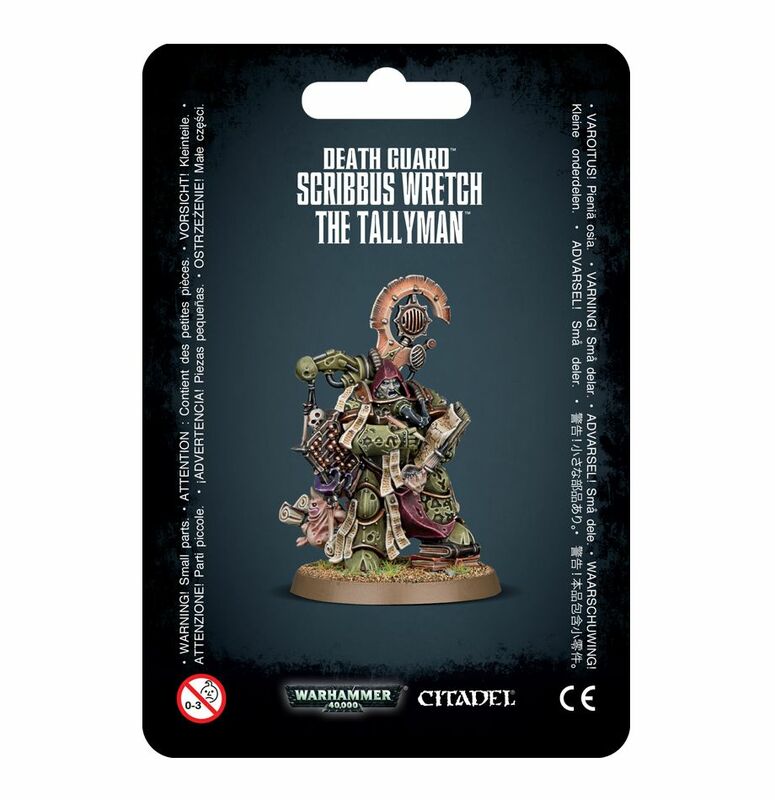 This multi-part plastic kit contains the parts necessary to assemble Scribbus Wretch, a Death Guard Tallyman. 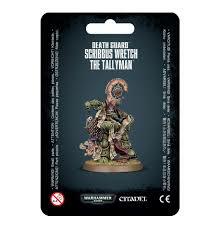 His is a particularly unpleasant model, even for Death Guard, with a morbid focus on gleefully counting and cataloguing misfortune – he carries a massive ream of paper on a clipboard in the crook of his left arm, with a bone stylus in his right adding to his tallies. A strange apparatus hangs from his back, ending in a tentacle that grasps an abacus – its beads, upon closer inspection, reveal themselves as skulls. His armour, as standard for the Death Guard, is covered in corrosion, boils and Nurgle icons, and he is accompanied by a Nurgling, busy with the task of carrying extra ink and paper. Scribbus Wretch stands atop a pile of books; likely written by him, and full of atrocities. This kit comes as 8 components, and is supplied with a Citadel 40mm Round base..